As a new parent it is difficult to know which baby items are “must haves”, “nice to haves”, and “wish we didn’t have”. When we created our baby registry for Cecilia, we invested hours and hours reading reviews and ratings for the bulk of the items we added. While some of the items we received haven’t been used yet (mostly because she hasn’t met the minimum age requirement yet), there are several items that have already made our “favorites” list. Since I relied so heavily on other parent’s experiences with different products, it seemed fitting to start sharing our experience here. For the next several weeks, we will be taking an in-depth look at some of the most popular baby items on the market. Hopefully, you will find these reviews helpful when starting your own baby registry or before making a new purchase. Have you ever visited a friend’s house that had children? If you were looking around, you probably noticed something that your single friend’s houses are missing. Kid stuff. Everywhere. Although some of it can be contained to an extent, you will find that it is easier for certain items to find a home outside of the nursery. With that said, if you are like me then you will want to figure out the best way for both mama to be happy and baby to not be bored. One way to find that balance is to consolidate. One of the questions I Googled several times is, Do you need a swing and a bouncer? For those not familiar with these items, a bouncer is a seat that vibrates. It’s typically smaller and less expensive than a swing. A swing does just that, swings. It sits higher off the ground and usually costs quite a bit more than the bouncer. However, being able to put your baby down for ten minutes while you take a breath is priceless so it’s important that you have something on hand that your baby enjoys. While researching the mommy blogs and message boards it became clear that the need for one or the other was simply based on the baby’s preference. Some babies prefer bouncers, some babies prefer swings, some babies like both, and some dislike both. Well, that research was of no help at all. I wanted to have some form of entertainment for the baby when she arrived, but I really didn’t want to buy both a swing and bouncer. I was leaning towards the bouncer when I saw this product. The Ingenuity Swing-2-Seat solves the problem of having to choose between a swing or bouncer because it essentially is both. With a soft fabric lining and five point safety belt, it is both comfortable and safe for the baby. It also has a lock feature to keep the seat stationary when placing the baby in the seat. There are two small stuffed elephant toys hanging above for your child to stay engaged and space to add additional toys. The seat is able to vibrate while stationary or swinging which is helpful when trying out different methods for keeping your baby content. There are five speed settings available for the swing, although we have never used it above four. It also has several songs built-in which over time you will find completely annoying, but it never seems to phase the baby. 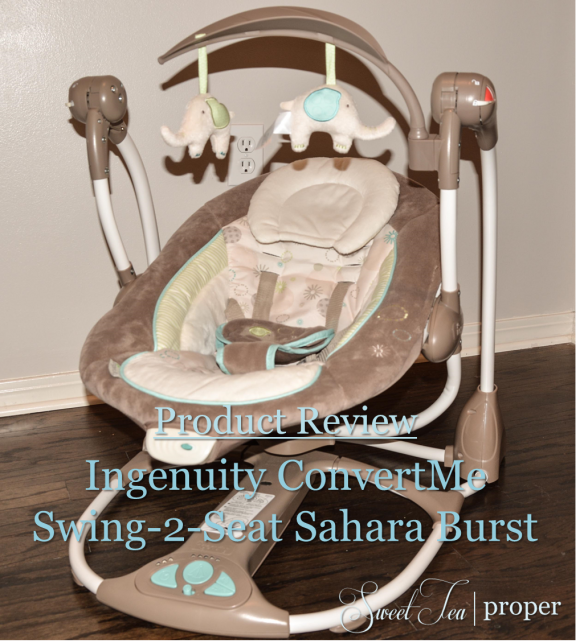 It provides a swing and bouncer in one product. That’s the obvious one! It is compact. Beyond having the capabilities of two products in one, the Swing-2-Seat is closer in size to the bouncer than the swing. This makes it easy to move around and hide in a corner when not in use. It is affordable. Depending where you purchase it, the price for the Swing-2-Seat is around $79 – $89 before tax. That is much cheaper than most baby swings. There are many options. With the ability to use the bouncer setting, swing setting, or both simultaneously, it gives parents a few tricks to see what your baby enjoys. It is low to the ground. While it’s compactness is a pro, it’s height is a chin in my opinion. Sitting barely over a foot off of the ground, it puts your baby on a much lower level than standard chairs. As your baby grows and becomes more curious it would seem more beneficial to have them up higher. Putting it together is somewhat challenging. Although it’s not the hardest piece I put together by myself, it definitely was not easy. The instructions are vague in some places and the parts don’t always click the first time. It requires two different kinds of batteries – 4 D and 1 C. As if buying batteries isn’t annoying (and expensive) enough, to use the full functionality of this product, you have to purchase two different kinds. We tried to (unsuccessfully) put our baby in the Swing-2-Seat several times before she took to it. Now, we love it! Being able to put the baby down somewhere safe while I cook dinner, clean the house, or play on Pinterest is a lifesaver. We started out using the bouncer capability and gradually moved up to the swing. Depending on her mood, our baby seems to like both features. In true product review fashion – Yes, I would recommend this product to a friend. Disclosure: I have not received any compensation for writing this post. I have no material connection to the brands, products, or services that I have mentioned. All opinions expressed in this blog post are my own.